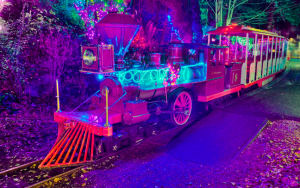 Stanley Park Christmas Train: This holiday favourite is one that is perfect for families with small children, and, with over 2 million lights woven into the frosty forests of Stanley Park, folks of all ages will find themselves engaged in the spectacle as well. With a diverse range of available run times, you will easily be able to fit this into any busy schedule as well. 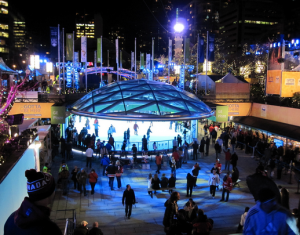 Robson Square Ice Rink: Located in the heart of the city, this festive winter tradition is easily the most affordable thing on this list. Why? Because (other than the whopping $4.00 you may need to spend on rentals) this one is totally cost-free. Nothing screams nostalgia quite like pirouetting across the well groomed ice with loved ones. 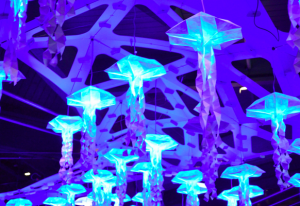 Vancouver Aquarium’s Luminescence: Perfect for all of those aspiring marine biologists, this phenomenal light display revolves around naturally occurring fluorescent and bioluminescent ocean light. Great fun for all with an interest in ocean critters. They also feature Scuba Claus, an underwater take on one of the holidays’ biggest icons. Santaland Diaries: This ridiculously hilarious play presented by the Vancouver Artsclub offers side-splitting laughs for ‘mature elves only’. By delving into the exploits of an elf on duty at a big-box store, these clever playwrights have created a comedic masterpiece. 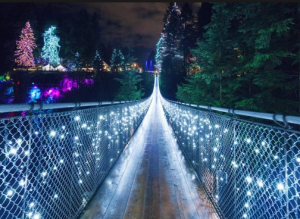 Canyon Lights at Capilano: Unless you are riding a flying sleigh, a fear of heights is never something that should be heavily associated with the holidays… unless you meander over to the Capilano Suspension Bridge’s 70 meter drop that also happens to be decorated with one of the most astoundingly gorgeous light displays that the city has to offer. 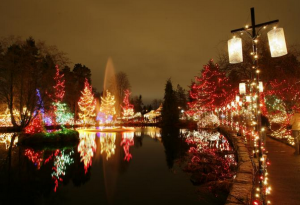 Festival Of Lights: If none of the aforementioned events are visually appealing enough for you, then look no further than VanDusen Botanical Garden’s sparkly yuletide display. With attractions ranging from a real life Santa Claus to the mesmerizing ‘dancing lights’ of Livingstone Lake, this one has a lot to offer for those looking for some traditional holiday splendor. A Bread Affair hopes that at least some of these events appeals to you, dear reader. If not, then rest assured that Vancouver has a lot more to offer in terms of festivities! Whichever you choose, remember that, whether you are gliding across Robson square on skates or gingerly traipsing the rickety Capilano Suspension Bridge, the real important thing here is going out and spending time with your friends and family. We hope you have a phenomenal holiday and can’t wait to see what 2017 has baking in store for us!